Priced at $2,475.00 per box (wow) at the wholesale level, this isn’t a box for the everyday man. As the name suggests, this will probably be broken by online group breakers. Without a complete checklist or even a set amount of cards per box, it might be difficult to figure out how to conduct a break, but I’m sure they’ll figure out a way to get them done. 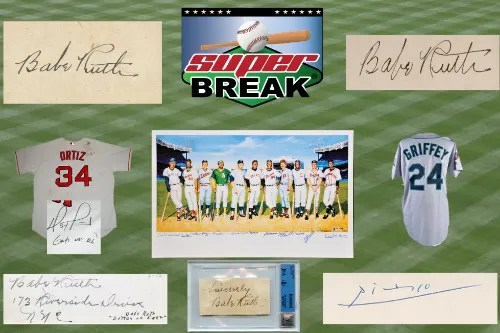 Super Break, was formally known as “Super Box” and are produced by Southbay Baseball Cards in California. Southbay buys a bunch of cards and memorabilia and creates a buyback product such as this one. Inside each box is a mixture of graded cards and memorabilia items. Many of the memorabilia items are live inside the box. Cards and autograph items come graded/authenticated by PSA, BGS & SGC. Every box is serial numbered, and cards inside are packaged in a wrapper. Super Break says that less than 200 boxes are being produced. 50-100 Superfractors – Including Jose Fernandez & Wil Myers Bowman Chrome RC Superfractors. Rookie Cards of: Joe DiMaggio, Hank Aaron, Willie Mays, Hank Greenberg, Pete Rose, Ernie Banks, Yasiel Puig, Bryce Harper, Mike Trout, Sadahara Oh, and more. Autographed Jerseys: Wil Myers, Byron Buxton, Mike Trout, Manny Machado, Willie Mays, Sandy Koufax, Derek Jeter, David Ortiz, Ken Griffey Jr, Mariano Rivera, and more. President Autographs: James Monroe, James Madison, Franklin D. Roosevelt, Theodore Roosevelt, and more. Famous Figure Autographs: Pablo Picasso, The Beatles, Thomas Edison, Amelia Earhart, Andy Warhol, Muhammad Ali, Pele, Cristiano Ronaldo, Walt Disney, Frank Sinatra, John Wayne and more.